The Books for Walls Project: Save Troy Library Week**: Saving a Library with Kid POWER! Save Troy Library Week**: Saving a Library with Kid POWER! Together, the Four of Us chose to support literacy and libraries, we are not affiliated with any groups, we are not paid, we are simply inspired. Our experience working to save Troy Public Library has helped us see even more clearly how important libraries are for all children. Watching The Sisters and the amazing Yashinsky siblings together gave us renewed energy and hope for libraries everywhere, because there are children all over the world ready to stand up for what they believe in... and wow, adults, perhaps we need to stand back and let them get to work! This week we had the pleasure of meeting the Yashinsky Family who just happened to be vacationing in our neck of the woods. This fabulous five-some are the happy power driving the Kids Petition (and Rally) to Save Troy Public Library. Their latest effort is a rally on August 1st, one day before the election. The Sisters interviewed Rafael, Ariela, and Elian, first by email, then via Skype and finally, in person. Where do two library loving families meet? Why at the library of course! They took a morning away from their vacation to meet and share some thoughts. We had a wonderful time. And now... The Sisters' interview with Rafael, Ariela and Elian! The Sisters: "What are your favorite books?" Rafael (12): The My Side of the Mountain series about living in the Wild and Free in the Catskills. The Sisters: "What will you do if the library closes?" Ariela: "Buy books and movies, or try to go to another library." Elian: "I will try to go to another library." Rafael: "I will try to make my own library for other people." The Sisters: "What is your favorite part of Troy Public Library?" Ariela: "It totally has to be that there are so many kids and adults enjoying reading or watching movies or getting information." Elian: "The books and the puppets"
Rafael: "My favorite part of the library is that its a place you can go and get all sorts of books and information in one place." The Sisters: "Has anyone been mean or unsupportive of your work? How did you handle it, if the work got hard?" Ariela: "Actually no, everyone has been very supportive, teachers and students; it has just been great." Elian: "Not really anyone tried to criticize my work or make it hard so it was pretty easy." Rafael: "I don't remember anyone at all who was criticizing my work, in fact there was absolutely no problems." The Sisters: "Tell us more about what you did and plan to do to save TPL." 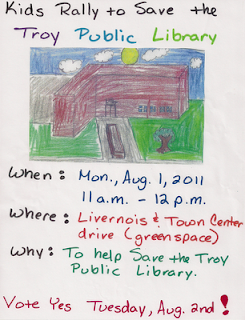 Ariela: "I started a petition to save the Troy Public Library to bring to the Troy City Council. We gathered signatures from the kids and teachers at school and people around our neighborhood. Then we got interviewed by the Oakland Press newspaper, and we got to go on Local 4 and get interviewed with Rhonda Walker. We got to go on a tour of the television studio and stay in the green room, which was pretty awesome." Elian: "I gathered signatures for my petition and talked to the reporter and went on the TV, and went to the green (room). It was awesome just so awesome. I just want to do it again and again." Rafael: "I started off with a petition and then eventually we started to get more popular by helping our community. Then we got so popular we ended up on Local 4 News. After that we went up to city council. We ended up getting the library to stay open for just a little while longer and for another vote. So we decided to form a rally to keep the library open by getting other people to vote yes to save the library." Rafael says, "come to the rally!" **This week rather than Save Troy Library Tuesday, we decided to have Save Troy Library Week (we'll be back to all the summer fun Reading Books and Writing Stories next week). We'll share updates and information on the August 2nd election (click here to see the ballot question). And on a personal note we are a little busy for the next 10 days, The Sisters are involved with Lakeside Shakespeare, The Big Sister is performing in Macbeth and A Midsummer Night's Dream (don't miss either!! 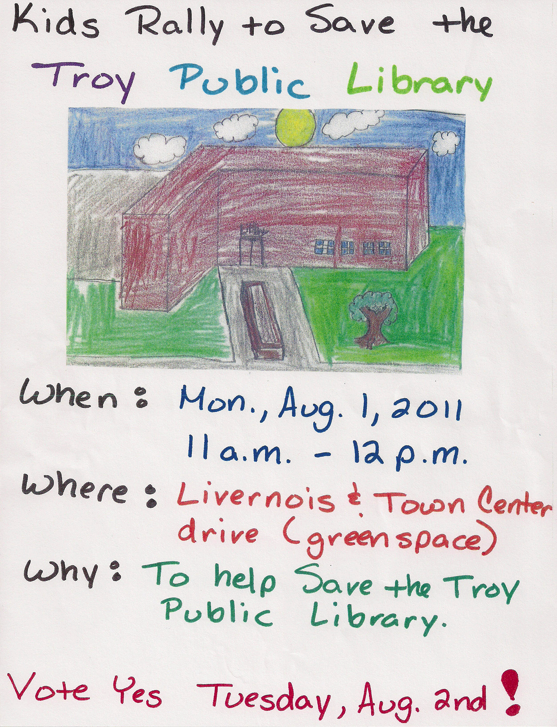 ), but we are making sure to keep focused on SAVE TROY LIBRARY!! What an inspirational story -- and such hope for the future! Thanks for all your support of TPL!